Lodi Teens Spending their Summers Making a Difference — Lodi Live! Kids are doing a lot these days, and it’s really inspiring. I know a lot of people like to talk about how kids are entitled or spoiled or just eating tide-pods, and while those kids are definitely out there, there’s a huge other group of kids who are invested in making this world a better place. 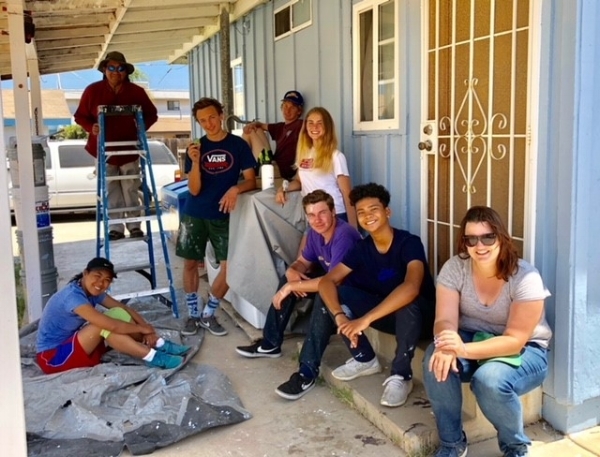 There’s a group of teens in Lodi involved in a program called the Sierra Service Project, or SSP. When I tell you these kids are amazing, I really mean it. We have really, really great kids right here in Lodi, dedicating themselves to making lives better for people they don’t even know. SSP is a Christian nonprofit organization where youth dedicate a week of their summer to service projects. In Lodi, it’s the teens at the First United Methodist Church (FUMC) who are part of SSP. So instead of going to a typical summer camp, these kids spend a week building things, mostly housing improvements for low income families across West coast. This year FUMC is sending 14 kids plus 4 adult counselors to San Diego to work on these projects. If you’re like me, and you’re wondering how much the kids will actually be doing. Believe it or not, these kids are putting in some serious manual labor. Of course they’ll be helping with the more cosmetic updates like paint, but they’re also getting trained to use power tools so they can actually be contribute the structural improvements also. Three of the kids who are going this year are Shaylee (17), Sidnee (16), and Trevor (15) and they’re really excited. “It’s very involved and you have to be able to work with other people and everyone is super friendly so it makes it super easy. You have to be willing to learn and want to work,” shared Shaylee. “After you meet the homeowners you hear their story and what they want done and the reason they want it done. Then you want to help and you want to finish the project and you want to do a good job.” Teens get a chance to talk with the people the project will benefit and find out why their work is so meaningful. The “Why” is such an important motivator for anyone embarking on a project. It’s especially important for youth who normally don’t have the years of experience as most adults. And thanks to this approach of talking with the people benefitting from these projects, the kids have a lot more empathy and understanding than, I think, most adults. This work makes an impact on others and it makes an impact on these teens that they’ll carry with them as they grow into adults. Trevor, Sidnee and Shaylee are really good kids with an ability to empathize with people better than many adults. Raising more loving kids can only benefit our community. This is the impact of getting kids and teens involved and giving them the opportunity to serve. They grow up to be caring adults. As the three of them continued sharing their experience with SSP with me (they really love it and are very excited to return) I asked them if they could change one thing in the world, what would it be? And they all agreed, everyone should have the opportunity to give back. “For everyone to have some type of service, because some people have never served they don’t get the point of why would you want to pay to go somewhere and work and labor. It just makes you feel like such a good human being, and that feeling stays with you for not only just the day after, but that feeling stays with you for a long time, and that’s why you want to go a year from then.” said Shayle. Sidnee agreed. “Yeah, you’ll leave and then be like, ‘oh I miss that, I want to go back.’” Trevor added, “Like last year when we were leaving we were already talking about where we wanted to go next year.” I’m so excited for these teens, and really inspired by them. I look forward to watching how another summer full of these rich experiences impacts who they will be as adults.